Also known as Slieve Cor or Corslieve. 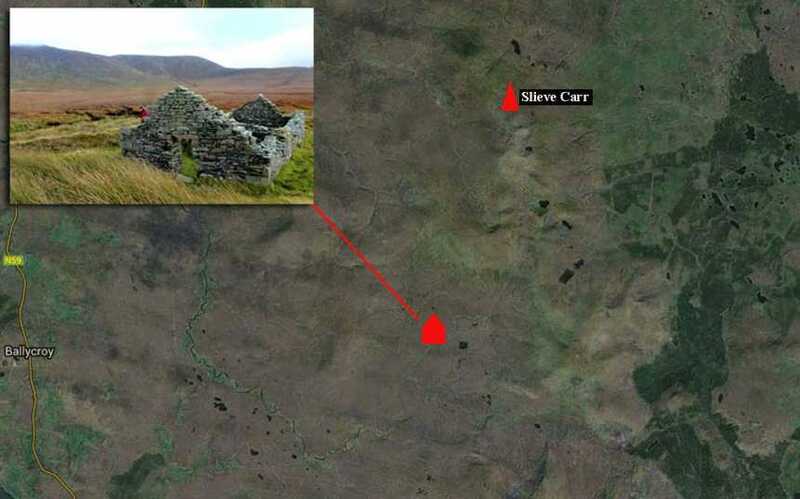 The Discovery map links the name Corslieve with a neighbouring peak (541m) situated about 3 miles to the south, but the Ordnance Survey Name Book and William Bald's map of Mayo (1830) show quite clearly that it is simply an alternative for Slieve Carr, with the same elements inverted. A cairn on the summit is named Laghtdauhybaun on the old ½ inch map, but is unnamed on the Discovery map. This is probably derived from Ir. Leacht Dáithí Bháin, 'burial monument of white Dáithí'. There may be a connection with Dáithí, a king of Connacht and reputed last pagan high-king of Ireland (see Slieve Alp). Slieve Carr is the second highest mountain in the North Mayo area and the 97th highest in Ireland. The most remote cottage in Ireland?